Hometeam is on a mission to change the way we age in America by empowering Caregivers. Operations needed a better way to manage information and communication with Caregivers. I conducted a series of kickoff exercises to understand our base reality, using the feedback as a springboard for user interviews with Caregivers and their network of Care Managers and Care Navigators. It became clear that information and communication issues were oftentimes critical with real world consequences for both Operations and Caregivers. A mobile application that allowed everyone to see relevant and up-to-date information would meet existing needs and support company growth goals as well. I began the design process with crude task flows and sketches. This allowed for quick discussion and changes with my project team. Once we agreed that both design and development could support those flows, I moved into lo- fi Axure wireframe and prototypes, which gave devs an even clearer understanding of how this app should function. I then moved these flows to Sketch for usability testing with Caregivers. Armed with their feedback, I was able to move into visual design phase. The visual design phase started with two constraints: our CEO loves purple and many of our Caregivers are older adults themselves, which means legibility needed to be treated with extra care. For the initial design direction, I used mood boards and visual design testing with Caregivers to arrive at the final product. The following visual design updates lightened things up in response to continued learning about both Caregiver mobile phone tendancies (e.g., manipulating text size and typography from their own phone settings) and how difficult Caregivers' jobs truly are. I wanted the home screen to do more than just provide information. I wanted it to set a positive tone for the oftentimes difficult day of caregiving ahead. I got the idea to use quotes, but a quick survey of caregiver quotes on the internet returned depressing/ condescending results. So I decided to ask Caregivers “What motivates you to be a great caregiver?” and with their consent, display their own quotes on the home screen with each load. Caregivers regularly commented about how celebrated and supported seeing these quotes makes them feel. Leading this project also lead to me leading the rebranding effort for Hometeam. Using a combination of design thinking and the Big IdeaL methodology, I partnered with the Director of Marketing to lead my company’s leadership teams through detailed rebranding workshops, emerging with a new lens with which Hometeam sees itself internally and externally. So far, this is my most meaningful product design experience. Caregivers now have access to things like schedule, payroll, the ability to apply for more hours, which is revolutionary for the home health care industry. 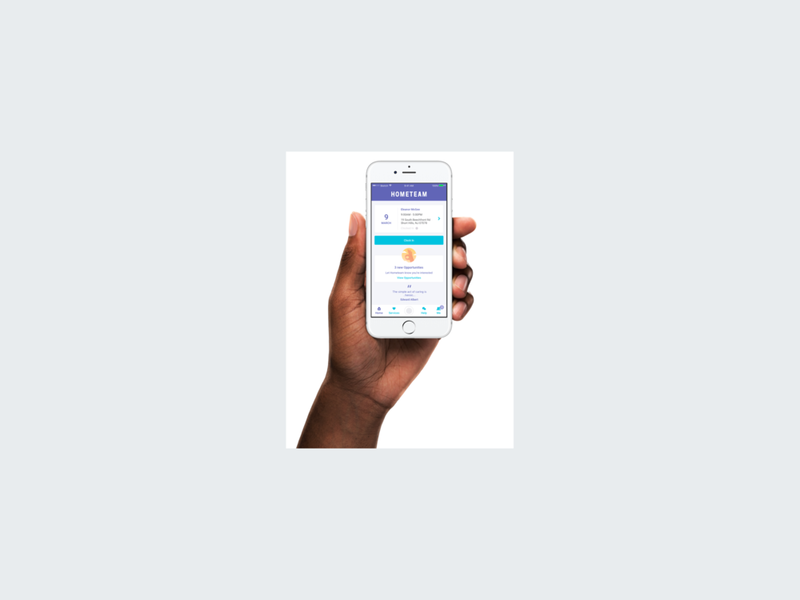 98% of our Caregivers, a generally tech- averse population, are using the application! But more than information access, this project reminded Hometeam to walk the walk, and through the power of design, Caregivers feel like they are truly supported by their agency.